Launched in 2011, Same Chic Different Day is a dynamic lifestyle blog that features fashionable people, places and things in Birmingham and beyond! 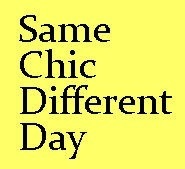 Click HERE to read Same Chic Different Day. You can follow the fabulosity @SameChicSouth on Twitter, @samechicdifferentday on Instagram or find it on Facebook by clicking HERE.